At Mafi, the entire philosophy is based on ensuring the most ecological use of this renewable, raw material, wood. This is reflected in all areas of the organisation from material procurement to production processes and maintenance. We source our timber from carefully managed forests in Central Europe, and FSC certified timber is available upon request. At Mafi there is a strong culture on ensuring we get the most out of every single tree. This efficiency has not only driven a better use of resource, it has driven innovation in product development. 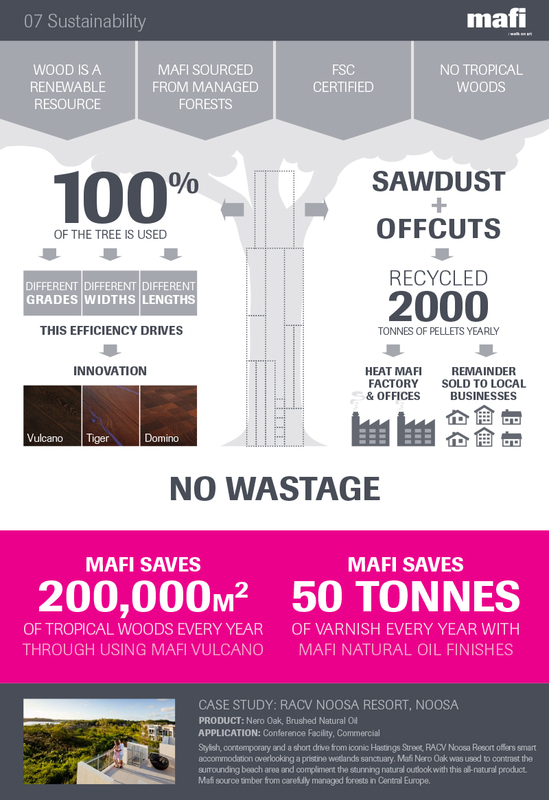 Mafi provides timber floors in a range of clarities, widths and lengths, promoting the natural beauty of different cuts of timber within the one tree. To achieve the darker colours in the Mafi range, timber boards are baked using only heat, wind, water and time. This technique made Mafi the first in its industry to develop a real alternative to tropical timbers. To ensure wastage is kept to a minimum, offcuts and sawdust are recycled and made into pellets that are used to heat and power the Mafi factory. Any extra are sold to surrounding businesses.